* Please, Apple Corps, Capitol Records, EMI or whoever owns the rights to the original Sgt. 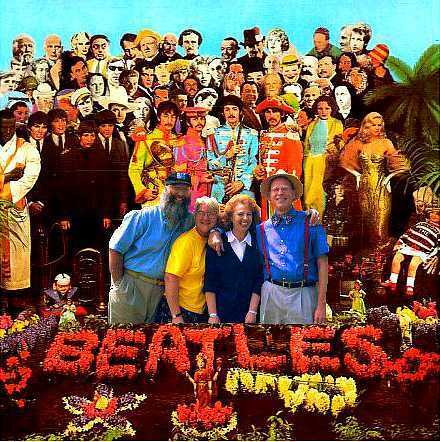 Pepper's album cover art, please don't make us take this "tribute" image down. We love and respect the Beatles and encourage everyone who visits this page to rush out and purchase Beatles records, tapes, videos... anything about our Favorite Fab Four. This tribute is not gratuitous. The Sgt. Peppers album cover is quite simply the Mona Lisa of pop culture art! We couldn't be seen in better company. Thanks, lads. You were truly the Marshal Generals of the Pop Cultural Revolution!